It's not that I'll never spend money. I happen to like Clarks shoes (which is a huge thing for me to admit publicly as I hate shopping and am hugely brand unaware and fashion oblivious (perhaps in fact an ideal candidate for What Not to Wear—Stacy? Clinton? Helllllo?)). I'm hard on my shoes, I like walking, and most shoes make my feet hurt. I found that Clarks (at least the old-school ones) are comfortable. They're also expensive. But the value to me is worth the price--or it would be, if I couldn't get them loads cheaper on eBay, which I can. But there are lots of things I won't spend money on, like rain barrels (which run $80 to $200, and which I made myself using a free 35-gallon barrel from Ann Arbor's water processing plant, instructions from Garden Gate magazine, and $20 in hardware. I built a compost bin out of wooden pallets that happened to be in my basement. I like trying to make things, so any time investment wasn't "lost," but fun. Sometimes, projects don't seem fun or they are way out of my league--when my sump pump broke last January and water was inching up in my basement, I called a plumber. When I needed ceiling fans installed, a called an electrician. Little projects I can tackle--I've figured out how to fix a toilet, unclog a sink drain by removing that pipe section thingie, and fixing the garbage disposal with my bare hands and a cool Allen-wrench type object. I wear almost entirely second-hand clothes. I'm an avid garage saler. I have awesome Danish modern furniture I bought at reasonable prices second hand. I love the modern, clean lines and practical, space saving design. And I love the idea that they have a history. I love craigslist. I didn't buy as much house as my banker wanted me to mortgage. My 2001 Ford Focus is still new to me, and I plan to drive her many years yet (highly, highly unusual in the Detroit area, I can assure you!). In the garden, I host an annual plant swap (May 17 for locals) and otherwise get plants from cuttings, friends, and of course through winter seed sowing. But I'll buy the occasional shrub (this year it's a witch hazel) because I can't propagate those and even if I could, I'm not that patient. In the fall I curbside shop for bagged leaves (the leaves go onto my beds as mulch or are shredded--with my mower--and added to my compost bin) and reuse the paper bags in spring. My point being, I weigh each possible expense and ponder its financial and time consequences and then decide what path to take. I don't immediately run to the store for everything I need. But I will pay for an experience--like travel (although even that can be done cheaply) and admissions to museums and botanical gardens. (When I'm in Victoria this fall, I will gladly pay my $28 to enter Butchart Gardens, who aren't on the AHS reciprocal garden list, thankyouverymuch.) I also enjoy both volunteering time and donating money to nature organizations. So, I don't recall how I found out about The Ultimate Cheapskate's Road Map to True Riches by Jeff Yeager, but was glad when my name came up on the hold list for the Ann Arbor Library's copy (you didn't think I'd pay for a copy, did you?!). It's a fun book, easy and quick to read. Jeff points out how everyone knows the saying time is money, but that it's also important to realize that money is time. The more time you spend in the pursuit of money, the less time you have to enjoy other things in life. He also advocates skipping what he calls "the money step," which is essentially what I talked about above--figuring out alternative ways to get what you need and thinking about whether you in fact really need the whatsit after all. He also suggests ending up in the house you start out in, instead of continually jumping to newer and fancier homes. There was a lot of other practical advice. Some of it may seem radical to people who enjoy shopping, but it fit really well with how I already live my life. Another big point of his, and mine, is that spending less isn't about depriving yourself. It's about prioritizing what you want and how much you're willing to do/work to achieve it. I know I've never felt deprived; in fact I feel proud of my home and garden and what I've been able to make of them even given my modest income. The only thing I've ever resented is having to work a job I don't enjoy. He was just like you would have guessed from reading his book: down to earth, funny, interesting, and informative. After the talk, I stood in line to have him sign my library copy of his book--which I knew he'd appreciate. 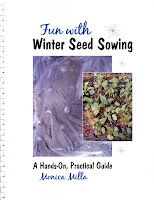 I also had a copy of Fun with Winter Seed Sowing on hand and gave it to him "in compensation for the fact that I didn't buy his book." Now, I knew he had an interest in gardening, and winter seed sowing is certainly a frugal way to get more plants, so that was in line. I contemplated a long time whether pushing my book onto him would be seen as stalkerish or wannabe-ish, or if it would be a welcome gesture from a fellow frugal writer. I decided to go for it at the last minute. He actually seemed pleased to take the book, saying he liked gardening, and asking me to sign it. So that went really well and was worth the cost of gas! Update: First in a series on ABC News, Cramming the Most Into Time, about a poll that shows Americans would rather have more time than more money. Nothing wrong with being frugal... and having him sign the library book? That's priceless! I'm sure the library will appreciate that. Maybe they will give you the book? Fun stuff! I enjoy being frugal too, then sometimes I just go off the deep end and hemorrhage money (usually over plants! ;-) Nice that you got to exchange books with a fellow author. From your description of him I'd have been surprised if he took a snotty attitude to the gesture. Lisa, one can be frugal and still treat oneself to a priority--like plants! :) Jeff was not at all snotty and seemed to welcome my book gesture, it's just that I tend to overthink some things. Sometimes this is good because I see the big picture and come up with creative solutions others miss, but other times it means I over worry and start to question myself. Ah, the joys of being raised German! This is nothing to do with gardening - but - in this posting you touch one of the bees in my bonnet - continually moving house as families expand and contract. The very term 'Starter Home' irritates me. I enjoyed meeting you and greatly appreciate the book you gave me. Thanks, too, for writing about my little book in your blog. I love this post! Thank you for visiting my blog and I'll be sure to link to your from my website. I'm on my way to get that book -- from the library of course! GET OUT... you were in my neck of the woods! I don't think I was blogging at this time so we wouldn't have known each other. STOP BACK sometime for dinner in the garden at my place!